After you create a project for your Gamestar Mechanic class, you can edit any of the settings you chose when setting up the project. Click the Class Projects button in your workshop, under the section labeled with the name of your class. This action opens the My Projects page where you created your first project. 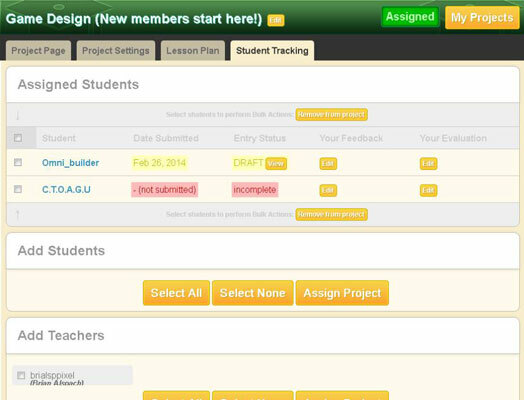 Student Tracking: Clicking this button opens a page that shows information about your students’ work on the project. The page lists each student’s name, the status of the students’ entries, the date when the entries were submitted (if applicable), and text containing your feedback and evaluation for the entry. Use the orange Edit buttons to change your feedback (notes on the student’s entry) and evaluation (the student’s grade, if applicable). In addition, you can select any number of students and click Remove Project to remove the project from their workshops, or add new students to the project, similarly to when the project was created. Project Page: Clicking this button opens a page showing your instructions, the starting and ending dates of the project, some information provided by the site, and the playable Project Games. From this page, you can modify your instructions, and change the project dates to start the project or end the project, or simply revise the due date. Project Settings: Clicking this button takes you to the Project Settings page, which you used to create the project. There, you can edit any of the settings you previously selected. Lesson Plan: Click this button to display the recommended lesson plan for your project. You can copy or print the information on this page for reference in your class. Clicking any of the orange buttons described in the preceding list opens a page with four tabs at the top that link to the other pages that are accessible by clicking the orange buttons. Use these tabs to quickly check several components of your project quickly.